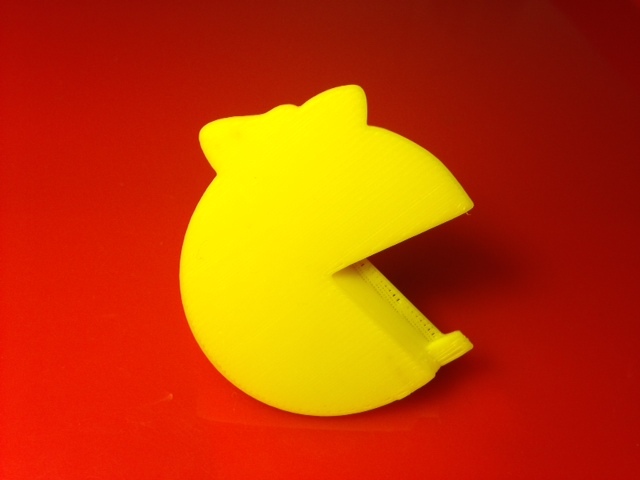 On Thingiverse, peterpur's round Letter Opener is just one step away from being Pac-Man. Or Ms. PacMan, maybe? Settings: Afinia H-Series on .2mm default normal, with a raft, in 21 minutes. Technical notes: This model was made in Tinkercad, starting with mardenz's silhouette of Ms. PacMan. So that the raft separates well from the thin "blade" of the model, make sure that the Afinia's build platform is not set too high. More space between the nozzle and the platform helps the raft stay separate from the model. Stuff you might want to change: This isn't the sharpest, best letter opener in the world, but it is better than getting a paper cut. It is also safe for little kids to handle.